Gudirr, Gudirr is a solo show, a dance format that we don’t see all that often. A solo show needs a strong performer for a start—someone who single-handedly can hold the audience’s attention for an hour or so. Dalisa Pigram did exactly that in Gudirr, Gudirr. But just as importantly, a solo show needs a powerful idea behind it, and a coherent structure in which the idea can develop. Gudirr, Gudirr had both the message and the structure. The Guwayi bird flies very low across the intertidal area to warn people out on the reef that the tide is coming in. It warns people that it is time to move because the tide brings danger. It is a warning to take heed of, and not to ignore the signs. The Guwayi bird does not tell lies. I told this story to Dalisa because the story of the Guwayi bird can be used to reflect on the social challenges that Indigenous people face today. The warning sign from the Guwayi bird can go one of two ways. We are either going to drown because we are not reading the signs of our disempowerment, or we will hear the warnings and we will take steps. Pigram believes strongly that the young people of the Broome community must read the signs and take those steps. The work begins with words scrolling down a screen at the back of the performing space. The words were written by A. O Neville, so-called ‘Chief Protector of Aborigines’ in Western Australia from 1915 for several decades after that. The words are nothing short of confronting with their reference to ‘quadroons’ and ‘h/c’ people. But, while I was expecting the show to continue to be confronting, ultimately it was moving, powerful and totally absorbing. 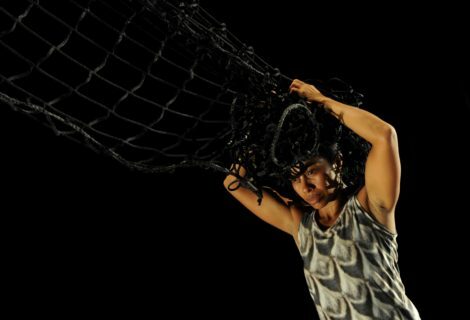 In a series of disparate scenes, some accompanied by projections of the faces of people from Broome, or footage of young people engaged in a bit of a street fight, Pigram worked through her frustrations at the difficulties she believes Indigenous people face. These scenes, including the section in which pretty much every word Pigram spoke started with ‘f’, were sometimes hilarious. How quickly can the meaning and impact of a word be changed when used over and over? Great theatre! 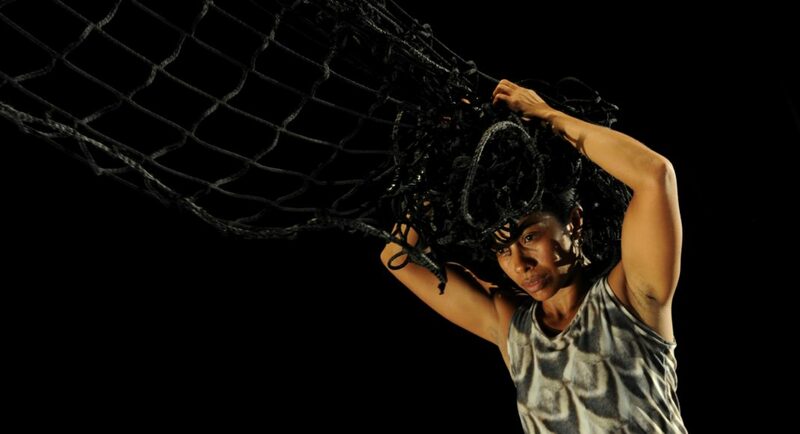 Choreographically, Pigram drew upon the variety of dance styles that have been part of her cultural heritage. In the opening moments her movement derived from silat, a Malaysian form of martial arts that Pigram learnt from a relative. 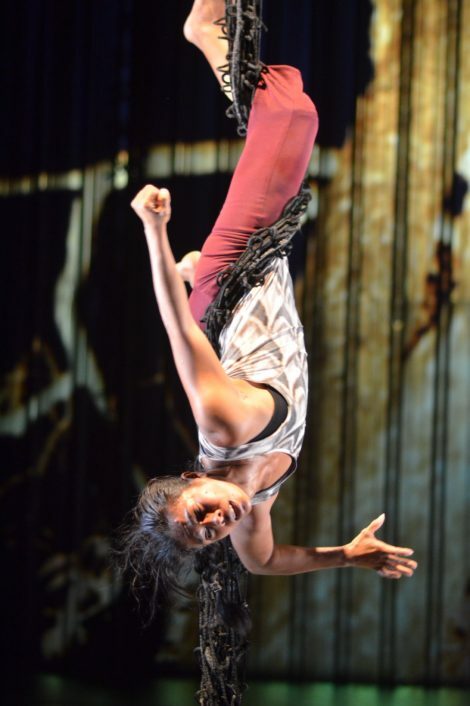 At other times, Pigram’s Indigenous heritage was clear in movements that were quite grounded and recalled women’s dances where the body is bent slightly forward and the feet move with slow, tightly held walking steps. But for me the most interesting sections were those when Pigram made use of the suspended fishing net that was part of the set/props. She has spoken of it having multiple functions, from entangling her to giving her freedom. She used it early in the piece in a joyous manner when she swung backwards and forwards and recalled with pleasure the times she spent out on the water fishing with her father. But at other times she looked as though she was indeed tangled in it, trying to escape. I loved this show. So many emotions were expressed and felt and, while the difficult moments, such as those when Pigram dwelt on youth suicide, were indeed confronting, I felt that the anger was mine not Pigram’s. She was bent of presenting herself as a woman of mixed heritage making an effort to understand and deal with the situation in which she found herself. That we could all have the courage to confront the issues that confound us!